Josep María Bartomeu, during an intervention before the Assembly of Compromisarios. The Barcelona Football Club has agreed to leave "without effect" the medals awarded to General Francisco Franco in the years 1971 and 1974, in addition to "all the honorific effects linked in the delivery". Said action, yes, will have to be submitted to vote in the next assembly of delegates of the club. "It has been a historical demand of our partners. And now that we have found documentary evidence that this happened, our board is very clear that it must take this step, "announced the spokesman of the governing team of the Catalan club, Josep Vives . «The gold medal that was given to General Franco in 1971 was to commemorate the inauguration of the Palau Blaugrana. The second, in 1974, was a gold medal commemorating the platinum wedding of Barcelona. That distinction had been delivered at first to the club of Manresa Barca. But at the request of the authorities of the time, which obliged that all newly created distinctions should be granted to Franco for the first time, we had to invent another one to give to the general. Nobody escapes the historical context », explained the spokesman of Barcelona. "They are curious cases, because there were no minutes of the meeting in which it was written that these medals had been granted. But graphic tests, at least one of them. In 2003, the board of directors at that time already convened an advisory council and considered that it was not necessary to withdraw said decorations because they were delivered in a dictatorial context . But our board has studied the reality, and now it will have to be the assembly of partners who decides ». 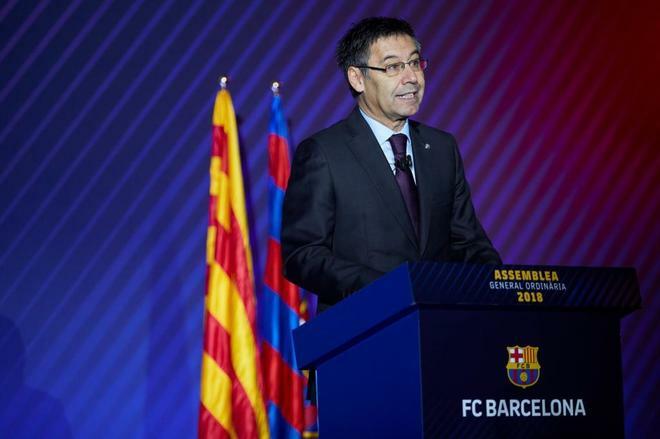 The announcement of the measure came in the prelude to the trial of the prisoners of the 'procés', which also spoke the spokesman azulgrana: "The club is against preventive detention. Those of us who have experienced these events and participated have very clear what happened. And that the solution must go through politics and dialogue . Not for a judicial process. The preventive detention of Sandro Rosell is also unfair. Like the one suffered by political prisoners who will be judged in Madrid. " Before settling his appearance, Josep Vives also defended Eric Abidal , former soccer player and current technical secretary of Barcelona and whose cause has reopened the Audiencia de Barcelona for alleged irregularities in his liver transplant. "We are clear about Eric's honesty, and also about his cousin, who saved his life ... If someone listens to those responsible for the hospital that operated on him and that the controls were validated by everyone, there is no doubt that there is no shadow of any suspicion in the case, it is bad for a person to whom they are subjecting inhuman and unjust suffering. "